Danze Victorian Style 12" Oil Rubbed Bronze Wall Mount Shower Arm & Flange: This Danze Victorian Style Shower Arm & Flange is built to last. The highest quality standards are used to precision manufacturer a top of the line fixture. Important features of this 100% BRAND NEW Fixture: Complete Item! Everything necessary for installation is included. 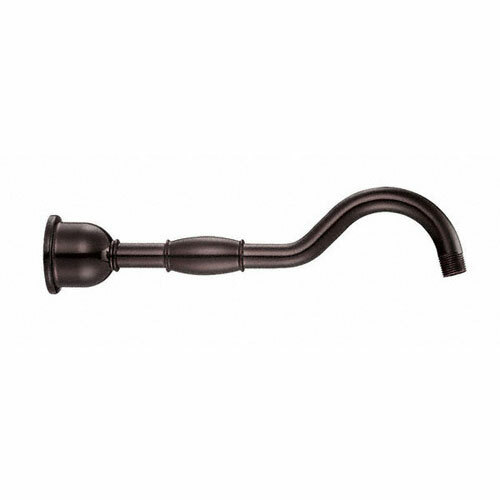 Oil Rubbed Bronze Wall Mount Shower Arm - 12" Victorian Style Shower Arm w Flange - To complete your Shower setup, Danze offers a variety of Shower arms in all different shapes and sizes. Take the Danze 12 in. Shower arm with flange for example. All are easy to install and will compliment a number of Danze Showerheads. - Solid brass construction for durability - Will work nicely with Danze Showerheads - Oil Rubbed Bronze premier finish designed to resist fading and tarnishing. - Easy installation - Seamless mounting along wall - Matching Accessories Available - Easy to Install - Installation instructions included. This fixture is manufactured by Danze and is part of their Victorian Style Shower Arm & Flange collection. To complete your Shower setup, Danze offers a variety of Shower arms in all different shapes and sizes. Take the Danze 12 in. Shower arm with flange for example. All are easy to install and will compliment a number of Danze Showerheads.